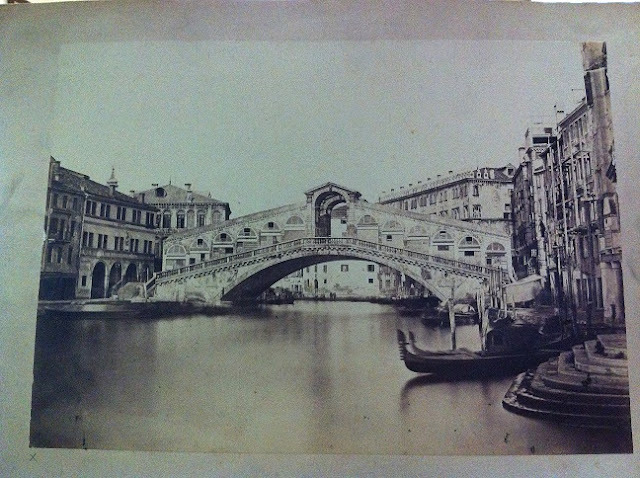 In my quest to learn more about Venice-based 19th century photographer, Carlo Naya, I went in search of some of his historic books at my local library. 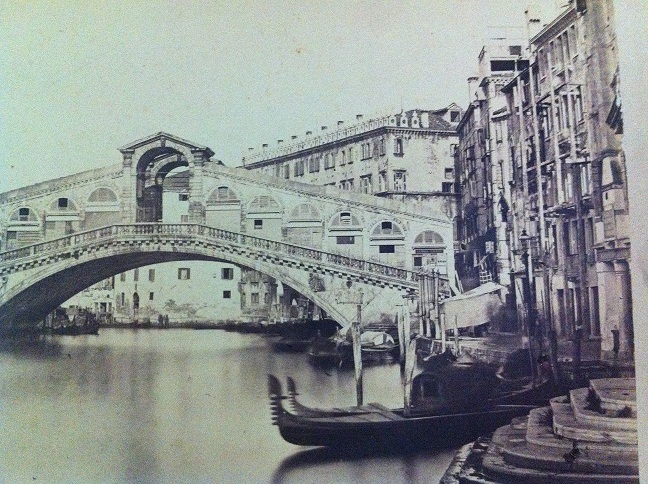 I was overwhelmed and delighted to find a copy of ‘Venezia’ containing 38 photos, mounted on sheets, of Venetian views printed during the 1880s. The photographs are obviously made for the tourist market. 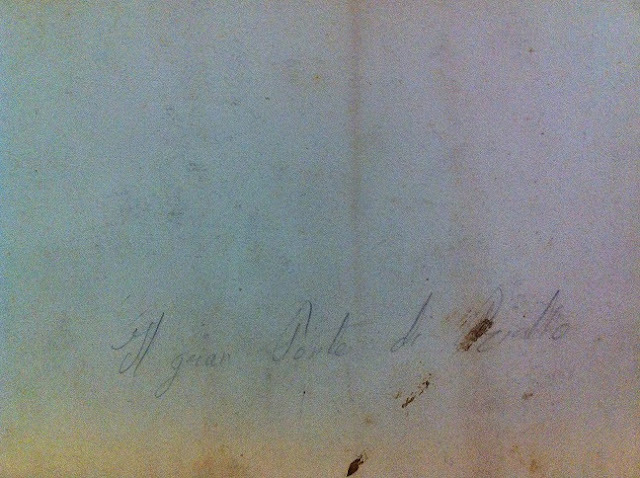 Most of the sheets are embossed with the attribution, Naya fotografo Venezia and captions describing the image are printed on the back of the sheets in English, French and German. The librarian kindly let me photograph the images...I only had my Iphone with me, and I didn't want to use the flash on works on paper, but the resulting photographs are legible. I have spent an absorbing Sunday afternoon studying the images. 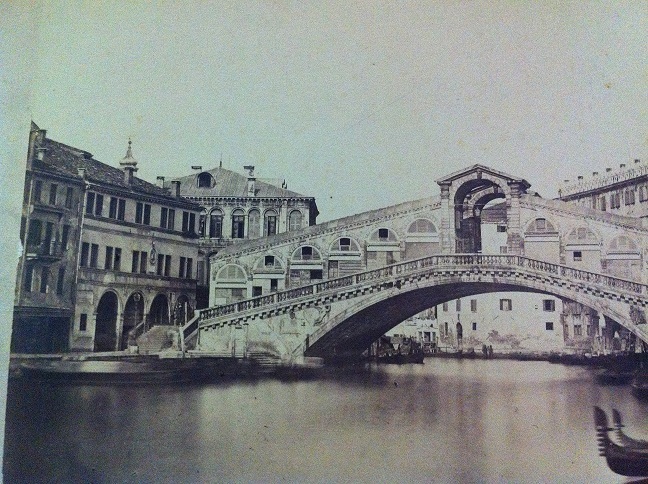 Here is a view of the Rialto bridge, together with two more detailed close ups of the photograph. On the reverse of the photograph, there is a handwritten inscription. Carlo Naya was born near Turin in 1816, and studied law at the University of Pisa. He worked as a professional daguerreotypist, operating in Prague in 1845 and then opening a studio in Constantinople in 1846. In 1857, he returned to Italy, moving to Venice to work with established publisher Carlo Ponti, who distributed his prints. The two men quarreled, and Naya opened his own studio. In 1886, he purchased a larger premises in Piazza San Marco. When he died in 1882, his wife continued to run the business, which eventually closed in 1918, when publisher Osvaldo Böhm bought most of Naya's archive. These are such wonderful images. It's amazing how still the water was before the motor boats came along to keep it churned up! Annie, you're right! I hadn't consicously noticed the stillness of the water. Thank you for making me look again at these images! I don't want to be picky (honestly!) but the flat water's down to the long exposures. Ditto the lack of people. Lovely stuff, though. A good Naya book is long overdue. Oh I see, it's about the long exposure. And yep, I agree, a good Naya book would be very welcome.